Join us at the Posen Senior Center; March 26th at 3:30 pm where Cheryl Kranzo of Medilodge will be here providing free blood pressure screenings. Ever wonder how two regular guys ended up with a popular PBS TV show and book that feature the cool people, places and things that make Michigan a great place to be? Providing caregivers with free practical resources, information and messages of empowerment. Join Alpena native Caitlin Borke as she performs the first of two homecoming concerts in one weekend with colleagues Samuel Macy and Gunta Laukmane. 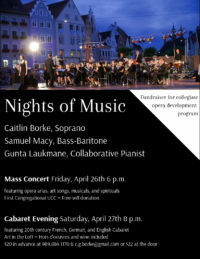 Be serenaded by soprano Caitlin Borke, bass-baritone Samuel Macy, and collaborative pianist Gunta Laukmane as they present a concert of cabaret music. Cub Scout Pack 3092 is hosting this family friendly dinner to raise funds for a new Pinewood Derby track! Humor Show with Artistic Jesting Themes & Open Mic Humor Slots! 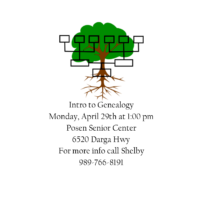 Free for all County residents. Be a mad scientist at the Library! 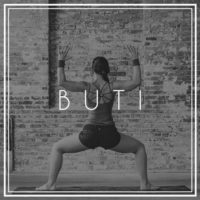 Join us for a day of all things buti!